Go for a long pass! Whether you’re at Sports Authority Field at Mile High or watching from the arena of your living room, there’s nothing like representing your favorite team during the big game! And when it comes to wearing a uniform with pride, it’s hard to beat the Orange Crush! That’s why this officially licensed NFL Denver Broncos Helmet and Jersey Set is the primo ticket to game day! 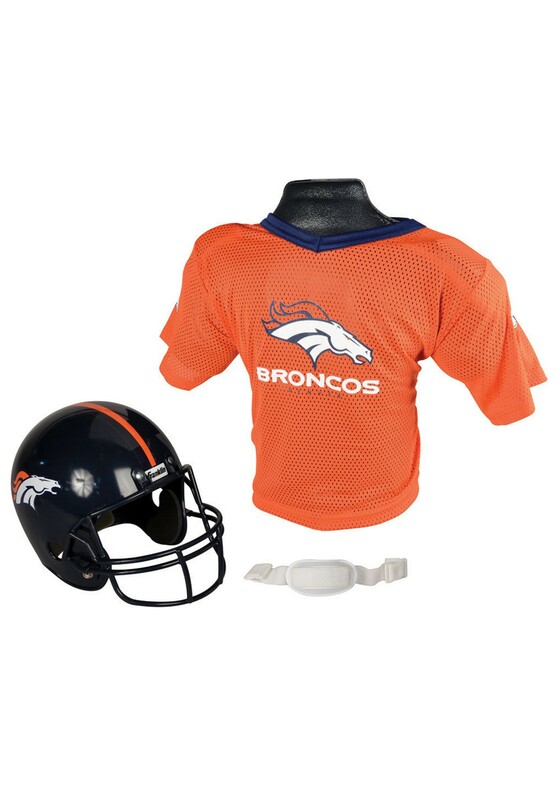 Make your child feel like an MVP by suiting them up in this fun set that features a jersey that sports the Broncos name and logo printed on front, and a shiny helmet with the Broncos logo on each side. In the jersey made of 100% polyester and a chin strap that snaps onto the helmet, repping these favorite team colors will have them feeling touch-down ready whether they're playing in the backyard, hanging out in the living room, or overlooking the field from the stadium seats in the mile high city!